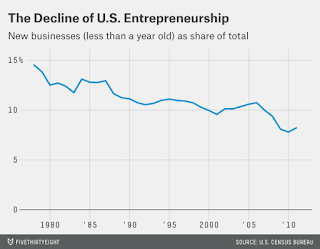 DWINDLING SMALL FAMILY BUSINESSES: America The Loser! America is increasingly dominated by large corporations, the Walmart, the McDonalds. 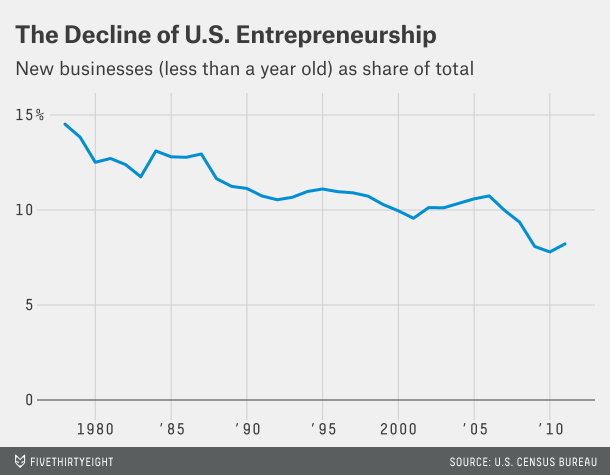 It isn't clear how much longer this trend will continue. AMERICA IS THE LOSER! We may or may not gain monetarily in the long run, that remains to be seen. We are losing out in quality and personal service. 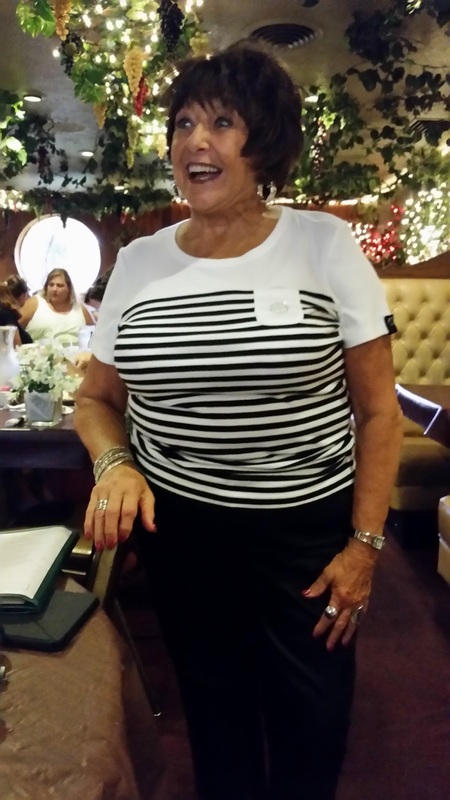 Betty Tamaso and her family opened an Italian restaurant 42 years ago. From all appearances, their business continues to grow. The Tamaso's are a good family. Our daughters went to high school together. Betty is not a sit in the office and check the receipts kind of gal, she gets out and talks to the people. If anything is not to their satisfaction, she makes it right in a hurry. A year ago my wife and I chose Tamaso's for our dining group. Everyone was thrilled. We ate in a private room that just held one large table for twelve people, just right for six couples. We met Missy the waitress that night. She had a huge abrasion on her chin from an automobile accident. It did not interfer with her providing first class service. She still serves Julie and I.
Julie couldn't decide between two kinds of wine. Missy brought her a sample of the unknown wine, a large sample. Julie took a sip then ordred it. I asked if I could taste the wine and Julie said okay. Hey, how was I to know there was more than one taste left in the glass? We decided to split a small anti pasta salad. 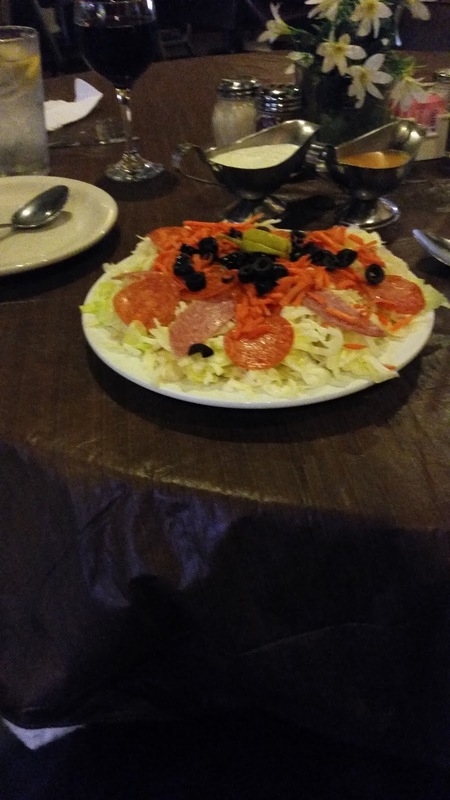 Uh, check out that salad. THAT'S A SMALL? We could not eat it all. We did eat a bit of garlic bread with it but, that was a big salad for two. Again, Julie couldn't decide if she wanted blue cheese or Italian dressing. Missy brought both. 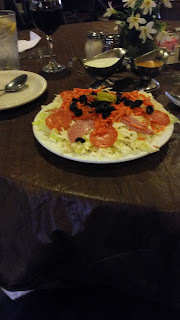 The salad was good but we decided to go back to the regular salad next time. A shame to waste what we couldn't eat. I ordered Veal Parmesan with spaghetti. 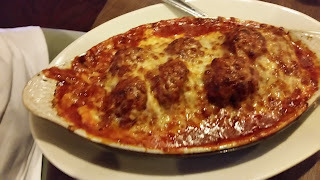 Julie ordered Lasagna with meat balls. The meat balls are beyond description. Over the meal is a layer of melted cheese. The top platter is too hot to touch and the food must be cooled somewhat before eating. We each ate half and took the rest for dinner tomorrow. We were treated special tonight, and we appreciate it. Normally, they give you a very small amount of sherbet after dinner. 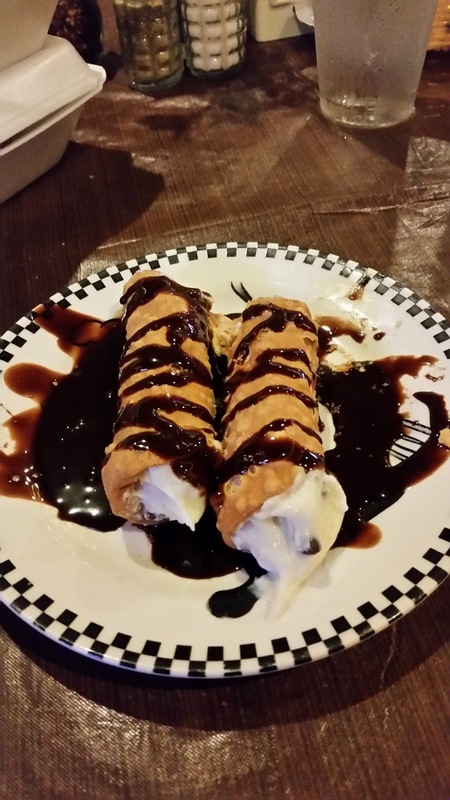 Tonight they gave us two beautiful chocolate cannoli. I enjoyed mine but Julie is not a chocolate person. Who is a big time chocolate person is our housekeeper, Donna. She is in for a treat tomorrow. When I see this dessert I always think of the TV show, "I Love Raymond" and of Marie. I usually judge a church by how many people stand around and talk after the service is over. 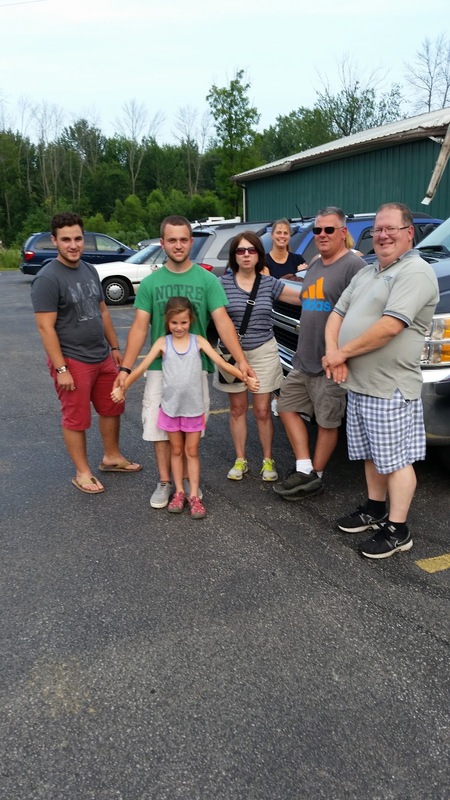 The attitude of the THOMAS FAMILY was similar as they stood around in the parking lot and chatted after dinner, not wanting to part. 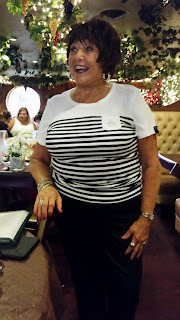 When I asked permission to include them in my blog, the spokesperson, (there is always a spokes person in every family), asked if my blog was risque. I chuckled and assured her she would have all her clothes on in my blog. They were good sports! The news is so bad that sometimes we think that America is all going down hill. As I watched a couple, with their mother, bow, pray and cross themselves before eating tonight, I felt reassured all will work out well. Tomaso's sounds like a wonderful restaurant!